MathILy-EST is an 8-week intensive summer research experience for exceptional first-year college students. Exceptional first-year college students are invited to apply, with second-year and entering college students also considered for participation. See info and appplication process. Seeking student volunteers for the National Math Festival in Washington, D.C.
Instructor Bjoern Muetzel is looking for volunteers to join him at the National Math Festival in Washington, D.C. on Saturday May 4 and present geometric games and activities to children and visitors. The festival hopes to “inspire and challenge all ages to see math in new and unexpected ways.” You may use your Byrne funds to cover travel expenses and the hotel, and there will be time to explore the festival. Congratulations to Shikhin Sethi ’19, the recipient of the 2019 John J. Byrne Jr. Prize in Mathematics! This prize is awarded to the top Dartmouth graduating mathematics major interested in continuing mathematics at the graduate level. The award will cover Shikhin’s tuition for the first year of graduate school at Princeton University. 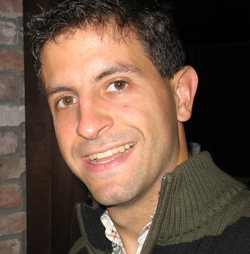 Math Professor Sergi Elizalde is the Byrne Scholars advisor. He is also the House Professor of East Wheelock House. Professor Elizalde has information on current research opportunities, including a summer program in data science at JHU's Applied Physics Laboratory, Mathematical Sciences Semesters in Guanajuato, Mexico, and more. As a Byrne Scholar, you may use up to $5000 per year (up to a total of $15,000 during your time at Dartmouth) for enrichment activities such as research, internships, or attending conferences. The application form is below under "Request Funding." All scholars are members of a Dartmouth email group which we will use to inform you of news, events, and opportunities. Anuraag Bukkuri ’21, is the student mentor for the Class of ’22 Byrne Scholars. Feel free to reach out to him with any questions about the program or about Dartmouth for which you want to hear a student’s perspective. Anuraag also provides information about Byrne gatherings, programs, and opportunities through GroupMe messaging. Please contact Anuraag if you would like to be added to the group. You are welcome to use the dedicated study room in Kemeny 121. Kindly be respectful of this space which the department graciously provides! We hope you join our informal dinners where everyone can meet each other and talk about recent projects. We usually have these once per term. Professor Elizalde has hosted recent dinners at his place near East Wheelock. Dartmouth Math Society, AWM Student Chapter, Dartmouth SIAM, and more!